Hi, Asus launched Nougat Rom based Asus ZenUI. This is a Asus ZenFone 4 Selfie Nougat Rom and here is an easy and safe tutorial for install new update ZenFone 4 Selfie ZD553KL Nougat Rom. Asus ZenFone 4 Selfie ZD553KL is a smartphone which is available in Dual SIM with 5.5 inch HD IPS LCD. ZenFone 4 Selfie has a 16 megapixel Rear camera with Dual LED, Dual 20 MP + 8 MP selfie cameras with LEd Flash and runs a Qualcomm MSM8937 Snapdragon 430 chipset. Step 1: Download ZenFone 4 Selfie ZD553KL Nougat Rom Zip file from above given link and rename it to update.zip. Copy this file into Your ZenFone storage. Step 3: Now your ZenFone in recovery mode, Then choose to apply update from sdcard. Step 4: Now select the update.zip file. Step 5: Now wait until the process complete and then Reboot the phone. Step 1: Download Asus Zenfone stock Firmware and Copy in desktop on your PC. 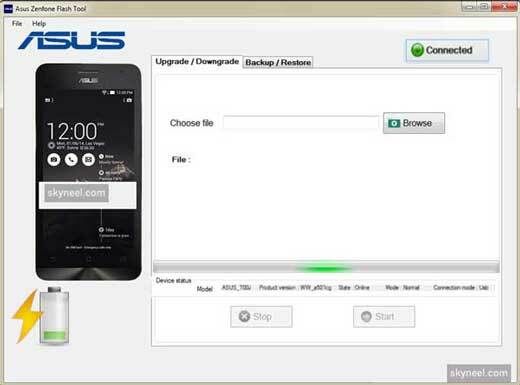 Open Asus flash tool. 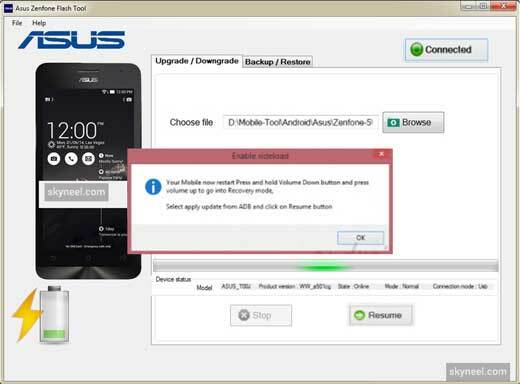 Now, connect your Asus Zenfone device to computer using USB cable and click on Disconnect option. Step 2: Now, locate the Asus Zenfone stock firmware and click on Browse button. Step 3: Click on Flash button to start flashing process. Now, Your device will restart automatically. Long press and Hold volume down and Volume Up button to Recovery mode. Your phone is going to Recovery mode. Step 4: Now, under the recovery mode Select Apply Update from ADB and Click on Resume button to resume the flashing process. Once, flashing process is completed you will see restart your device and disconnect from PC. After install new update ZenFone 4 Selfie ZD553KL Nougat Rom, you can root your phone because root allows you to use a maximum of your phone without any restrictions. After root you will install custom apps, Rom and custom setting in your phone. But first read Root Advantage and Disadvantage by this article. I hope you like this new update ZenFone 4 Selfie ZD553KL Nougat Rom installation guide from which you will be able to easily install new update ZenFone 4 Selfie ZD553KL Nougat Rom without any extra efforts. If feel any problem in this guide then please use comment box. Thanks to all.